The WebCrossing software suite is ideal for rapid development of highly customizable Web 2.0 applications. 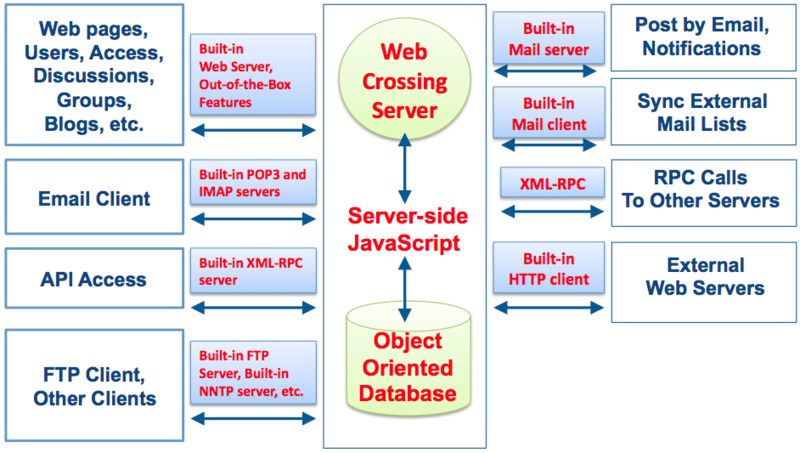 WebCrossing includes a built-in objected-oriented NoSQL database. If you’re doing something that requires complex data structures then a NoSQL object-oriented database is what you are looking for. The Webcrossing suite includes WebCrossing Community and WebCrossing Neighbors which are available as Hosted applications or as Self-hosted applications. It’s never been easier to launch a dynamic, interactive Web 2.0 solution for your business or organization. WebCrossing servers have been hard at work at thousands of sites for over 15 years. Why? Because of infinite customizability via object-oriented scripting, and a plethora of built-in features which shorten the idea to launch cycle by orders of magnitudes over other solutions. Truly everything you need for any Web 2.0 site. Launch your hosted site or self-host your own site starting today! Contact us for details. No separate email servers, operating system accounts, authentication systems, ftp servers or web servers are needed. It’s all one integrated solution. You won’t outgrow your WebCrossing installation. It’s all highly scalable with mirrored and distributed server clustering technology – also all built-in.